In India cricket is not just a sport but a shared public sentiment. It comes as no surprise that cricket is the most watched sport in the country and the upcoming season of the Indian Premier League is eagerly awaited by fans. As the nation prepares for the new IPL season starting March 23rd, YouGov India ran a survey to gauge the excitement levels of people. When asked about their favourite from the eight franchise teams, Chennai Super Kings emerged as the winner, with around a third (32%) voting for it as their favourite IPL team. Mumbai Indians and Royal Challengers Bangalore come in next, as the second and third most favoured teams. These three teams appear to be the most popular among people and are expected to battle it out for the coveted trophy. 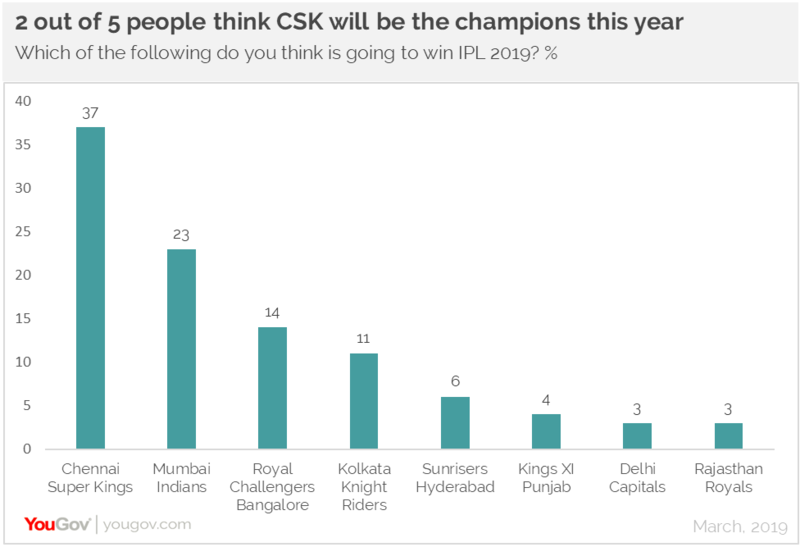 While nearly 2 in 5 people (37%) think CSK will take away the trophy in 2019, just over a fifth (23%) are hopeful of Mumbai Indians becoming the champions this year. However, 1 in 10 (14%) feel Royal Challengers Bangalore will be the winners this season. IPL isn’t just about cricket and teams, but also about the unparalleled stardom of cricketers. Virat Kohli is one of the biggest names in International cricket and one of the most loved players in India. 2 out of 5 people believe Virat Kohli is most likely to take away the Orange cap and become the highest scoring batsman of the season. His popularity is driven by female followers, with a higher number of women saying this as compared to men (44% vs 37%). On the other hand, around a fifth of people (18%) expect Jaspreet Bumrah to win the purple cap. But this time, more men than women (23% vs 9%) are making this claim. IPL is not just a time for cricket fans to enjoy the game and cherish their favourite players but is also a great marketing opportunity for brands. A host of brands join the celebration to drive exposure and recall. Naturally, most people think (85%) IPL is an ideal sponsorship platform for sports brands to showcase their offering. Even smartphone brands (81%) and mobile services (75%) are considered to be relevant for promotions during such sporting events. Furniture brands are considered to be least relevant for sponsorships. Brand Vivo will be pleased to know that its big spends have garnered highest recall among people when it comes to association with IPL. 1 in 3 people mentioned it as the first brand that comes to their mind when they think of IPL. Pepsi also has a high recall, with 16% recollecting it as a brand associated with the tournament. Paytm is the third most recalled brand. Where to catch the action? When it comes to enjoying their favourite game tournament, 7 in 10 viewers (68%) enjoy watching in on their television screens in the comfort of their homes. Around 1 in 10 prefer to watch it online on their phones or laptops (13%), watch it live in the stadium (10%) or at live screenings in restaurants/ pubs (9%). Data collected online by YouGov India among 992 respondents in the country in March 2019 using YouGov’s panel of an online representation of India.